Rain, rain go away. And DON’T come back another day! We’ve had our fair share of rotten weather at outdoor shows. Snow in October at the Cranberry Festival. 70 mph straight-line winds in Okoboji. Tornado sirens going off in Walnut. And last August in Oronoco, rain & more rain. It poured Thursday night during set-up. It rained Thursday night while we slept. It sprinkled off and on a good portion of Saturday. And then finally the sun decided to bless us on Sunday. OK. The weather was BAD. But let me give you the good news. 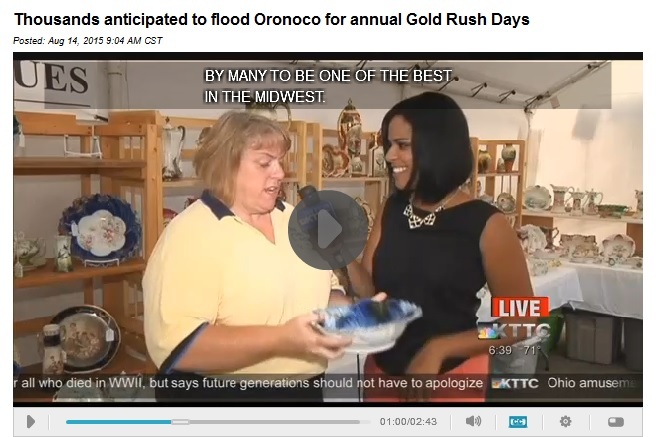 The volunteers…let me say that again, THE VOLUNTEERS at Oronoco Gold Rush SAVED THE DAY! The ground was pretty much saturated before we got there. So there really wasn’t anywhere for the water to go. So when it started raining on Thursday — it only took about 10 minutes before the water in our tent was mid-calf! We were devastated. We knew we couldn’t expect customers to walk through 8 inches of water to shop! And with so many friends that we only get to see at Gold Rush — the idea of having to shut down was — well — horrible. But it didn’t take long before the Oronoco Gold Rush Committee Volunteers swooped in. The fire department pumped the water out of our booth yet that evening. Our soaked tablecloths were washed and dried by a kind-hearted volunteer. Friday morning (at 5am) Skyler & Beau were at our booth — armed with a electric pump — to ensure that we would be ready for business at 8am. And then the whole committee checked back on us, regularly, all weekend long. So a BIG THANK YOU goes out to the Oronoco Gold Rush Committee. Those folks take a lot of grief, don’t get paid, and in 2016 had to deal with unbelievable weather — and they do it year after year with patience and a smile. We’ll never forget 2016 — not because of the weather — but because of the good people of Oronoco, Minnesota. I had to laugh. I wrote a blog post yesterday during lunch at my day job. I logged on tonight to type it in. I happened to look at the ‘most recent’ post. It too was from this same time period – last year! And to top it off, half of what I wrote yesterday repeats what I wrote a year ago. LOL So instead I will just say that we were happy to see everyone we did in Spirit Lake and look forward to seeing everyone who will come to visit us in Walnut! And be safe driving to see us.